Wybron's rugged, top-quality cables stand up to the demands of the most complex lighting rigs in the harshest of conditions. Because they've been exhaustively tested, these cables won't fail in the midst of a live production, ensuring every piece of gear operates exactly as planned. All XLR cables are built with reliable Neutrik connectors. And because they're black, they'll blend in with the rest of your rig – no shiny metal to draw audience attention. And to make custom labeling a breeze, Wybron wraps a segment of heatshrink plastic around every cable. Wybron offers many different lengths of pre-made cable as well as custom lengths tailored to your specifications. Or build your own cables with our raw cable and individually sold male and female connectors. Wybron's 4-pin cables transmit data and power for nearly every Wybron product, including the Coloram, CXI, and Forerunner color changers, and the Eclipse mechanical dowsers. 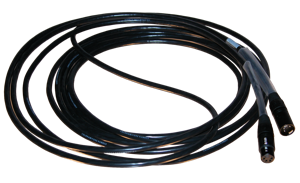 Wybron's 5-pin cables are industry-standard DMX data-transmitting cables. Wybron's 7-pin cables transmit data for Wybron's Autopilot II, the tracking system that turns moving lights into automated followspots. We're open 8 a.m. to 5 p.m. (U.S. Mountain time) Monday through Friday.